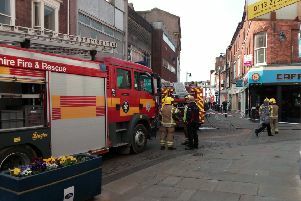 Emergency services attended a flat fire in Witham Town, Boston, at around 8.40am yesterday (Sunday May 17). Boston Wholetime, Retained, and Kirton attended the scene. A man, in his 40s, was seriously hurt and was taken to Pilgrim Hospital before later being transferred to a specialist burns unit in West Yorkshire. Two other casualties were taken to hospital. There was severe fire damage to the bathroom, and severe smoke damage to remainder of flat. Fire crews used two hose reels and four breathing apparatus while tackling the blaze. An investigation is underway to establish the cause of the fire. •Visit our website for updates as they become available.